NASA's Robonaut 2, which is currently stationed aboard the International Space Station, could be outfitted with a pair of legs as early as the start of next year. The anatomical upgrade will raise the spacefaring robot's height to an imposing 8-feet, and increase its potential for mobility considerably. Let's just hope it hasn't been infected with Stuxnet. With the addition of ultra-long legs, Robonaut will be able to move around freely by himself, and may even possibly replace an astronaut should the need arise. The robot may have the potentialof one day walking around on the moon or on other planets for weeks or months at a time, although it won't be doing so anytime soon, since NASA advancements move at the pace of a turtle. 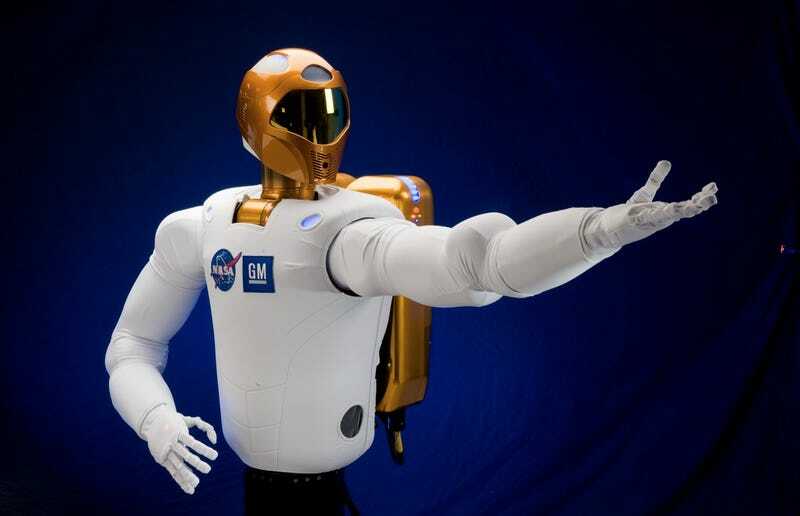 The robot is part of NASA's Project M and is currently in its 17th year of its 50 year development period. Testing, refining and integrating Robonaut's legs with its current interface will be necessary prior to its very first step. Unsurprisingly, the super-tall bot won't be taking baby steps: each of its strides will be spacious enough to quickly cover the area between the ISS's many modules, with a gait similar to an antelope's. More info on R2 and its new legs at DVICE, ABC News and NASA.